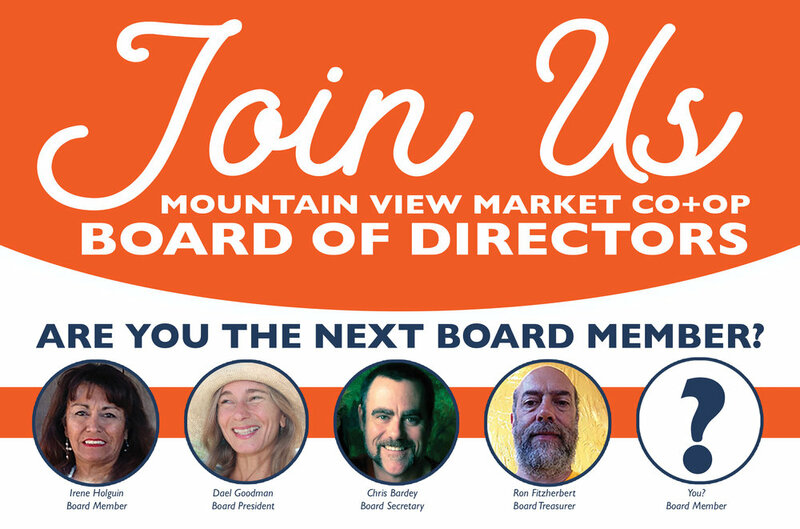 This year, the Mountain View Market Co+op Board of Directors has four seats available during their annual election in October. Are you the next Co+op Board Member? Want to know more about the Board's involvement in the Co+op? Read on for answers. The Board of Directors is the legal representation of the Owners and is responsible for the overall well-being of the Co+op. The Board exercises its authority through its relationship with the general manager, whom it hires and monitors. All of the Board's expectations and requirements for the general manager's performance are stated in the Board's written policies. The Board ensures the Co+ops success by making sure that the GM remains in compliance with the Board's policies. The Board does not involve itself in operational details. It does not make decisions about what the Co+op stocks, its personnel (other than the GM), or the color of the walls. The Board governs by declaring through its policies the results and actions it wants the GM to avoid while achieving those results. Constructive and creative leadership skills, and sound reasoning and judgement . Desire to develop visionary ideas through study, advisement and discussion, including the ability to speak up, listen well, and be receptive to differing views. Interest in Board process, and agreement to work within the Board's chosen framework, including development and refinement of new and existing policies. Connection to Owners beyond a narrow demographic and an interest in the whole organization. Willingness to publicly stand behind Board decisions regardless of personal positions. To qualify as a Board of Directors candidate, you must be an Owner in good standing and be willing to devote time to prepare for and attend Board meetings and events. Candidates are requested to submit a photograph, a brief personal statement, and responses to the candidate questions. The personal statement, plus the responses to the questions, must not equal more than 500 words. Printed candidate packets may be picked up at the Courtesy Desk at Mountain View Market Co+op or may be filled out online using this link. Mountain View Market Co+op, 1300 El Paseo Rd., Suite M, Las Cruces, NM 88001 or email your application to mountainviewmarketbod@gmail.com. Applications must be received on or before Thursday, September 20, 2018. There are four vacant seats of varying terms. Voting will take place from Thursday, October 18, 2018 through Thursday, November 15, 2018. New members will be officially seated at the November 28, 2018 board meeting. Candidates are encouraged to attend the Annual Owner Meeting and share their interest with those present. The Annual Owner Meeting will take place on Thursday, October 18, 2018. (Kindly refrain from campaigning at the Co+op). Attend and participate in monthly board meetings and scheduled study and engagement sessions. Attend and participate in the Annual Owner Meeting and other meeting of Owners. Participate in scheduled training and planning sessions. Participate in board committees and task forces. Arrive on time to meetings. Be reasonably accessible to Owners and participate in Co+op events. Fulfill any rotating duties, such as tabling, or meeting officer duties. Support and further develop Ends statements and other Board policies that reflect the needs of the Owners. Ensure financial solvency and integrity of the Co+op by reviewing monitoring reports. Support the agreements of the Board of Directors. Perform tasks conveyed by the Board of Directors. Understand and participate in the Board's decision-making process. Keep informed of the affairs of the Co+op and be prepared to discuss issues before the Board (such as attending staff meetings when possible). Evaluate the general manager's performance based on monitoring reports. Learn about cooperative organizations and the natural foods industry. Consider at all times Owner input in decision making. Keep Owners informed about the affairs of the Co+op. Listen openly and share opinions respectfully. Use agrees upon communication systems (such as the Board email) to share relevent information. Set clear and resonable boundaries. Respect the clear and reasonable boundaries of others.